The 5.7x28mm cartridge was designed from the ground up as a PDW (personal defense weapon) cartridge by Belgian company FN Herstal to fulfill NATO requirements. Introduced in 1991, 5.7x28mm ammo produces excellent medium range accuracy and very low felt recoil, though its muzzle report is relatively loud. Although not ultimately adopted by NATO as a whole, the 5.7x28mm is used by the military and security forces of many countries. It was developed for the FN P90 PDW and the FN Five-seven handgun; however, many other weapons now chamber it as well and AR-15 upper recievers can convert an AR platform rifle into a 5.7x28mm carbine. 5.7x28mm ammunition fires a relatively light 27-40 grain bullet at a high muzzle velocity of 1,600 to 2,200 feet per second. This caliber produces flat trajectories and can be used for both target shooting and hunting at close to medium range. At longer ranges in excess of a few hundred yards, 5.7x28mm ammo loses energy rapidly due to the low weight of the projectile; since it was never intended to be used at such distances, this is actually a safety benefit when defensive use is a consideration. Federal offers an economical target load that is highly cost-effective for high volume use; this ammo is of good quality and uses FN brass. 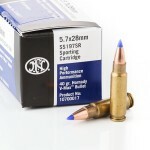 FN's hollow point offerings work well for varmint hunting and defense. Although this caliber was originally designed to be capable of defeating body armor, commercially available ammo is intended for use on unarmored assailants or animals. 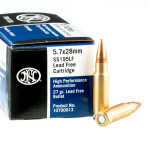 Here's a look at a couple of our fastest moving 5.7x28 ammo options. We try to keep a steady stream of ammo from both Federal American Eagle and FN-Herstal in-stock here at BulkAmmo.com so you'll always have a choice to shoot whatever you find most reliable in your rifle. Cheap ammo that's moving fast!